In the north of Nepal, adjacent to Tibet, just about 30 miles from Mount Everest, there is Phugmoche School. It was built near a tiny monastery on a huge rock, right under the towering slopes of northern Solu Valley. What is particular about Phugmoche? Phugmoche is a boarding school for the children of the Sherpa farmers. It lodges and feeds 70 children. About 35 day scholars from the neighbouring settlements attend school. Together with the boarders they receive a snack at lunch time. Altogether there are 105 children who go to school in Phugmoche. Besides teaching all the subjects of the Nepalese curriculum, Phugmoche School also preserves the Sherpa traditions based on Buddhist religion which the ancestors of the Sherpa once brought from eastern Tibet. This includes that the children learn to speak and write their mother tongue, the Sherpa language. The national language in the multi-ethnic state of Nepal is Nepali which is related to northern Indian Hindi. How did Phugmoche come into being? From 1990 to 1992 the school was built by Lama Ngawang Jinpa with the financial help of Freunde Nepals (Friends of Nepal), Munich in Germany. The association supported Phugmoche until 2004. From the planning phase on the project was cared for and looked after by Anneliese Dietrich. 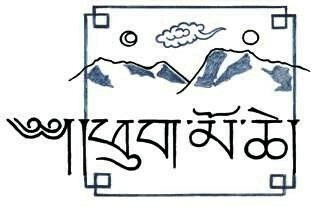 In August 2004 a group of friends of Phugmoche's founded the Phugmoche-Nepal Association. In the meantime four further buildings were added to the two original houses. Beneath the ice capped peaks of the Himalaya, a small school and development centre has come into being. Phugmoche offers education from class 1 to 8. We help our students to obtain the School Leaving Certificate after class 10 in another school. Most of the boys and girls, having left Phugmoche, still need our care. They often come from a very poor family background and cannot expect any support from their parents. Many of our children are orphans, some do not even know their fathers or mothers and had to earn their living as child servants. We give priority to those children. Almost all parents of our children are illiterate. Until recently the yak herders used to take their sons and daughters up to the high pastures as helpers. Today they are among our best students. Boys also have the opportunity of opting for the religious vocation. For those young men we offer 23 school places at Phugmoche. The other 47 to 50 places are reserved for children attending the 'regular school' for general education. Only ten years ago, girls' education was not regarded as necessary. Today, 50 % of our students are girls. has saved some of our children's lives. Tsering and Cheji were diagnosed as having tuberculosis in an advanced stage. They had to undergo an eight months' treatment, now they are in good health. An overlooked middle ear infection caused the inflammation of Sonam's scull bone. A 'last minute' operation and a full year's therapy turned the twelve-year-old boy into a happy and healthy child. Sonam Dolkar, a fifteen-year-old girl, received an artificial heart valve and thirteen-year-old Pasang was lucky to be operated in time otherwise his leg would have had to be amputated. Lhakpa Doma had a high fever. We took her to Kathmandu were she was diagnosed as suffering from a serious pneumonia. Her lungs were drained in the Intensive Care Unit. She could be cured and go back to Phugmoche. was inaugurated in April 2005. Since 1998 the German technical aid (gtz) and the Danish development agency (Danida) had helped us to plan building an electrical power station (35 to 40 KW). Now we mainly cook by electricity thus saving the natural woodland on the surrounding slopes. We are trying to found cottage industries in order to counter migration into the city. A paper manufacturing plant has just taken up its production using machines which are run by our electricity. The proud owner is a former student of Phugmoche's. by donations. 2000 Rupees monthly (about 20 € or 25 US $) or more are needed to send a child to school in Phugmoche: that includes teaching, board and lodgings and in some cases even clothing. The families are not in a position to afford to send their children to a boarding school. The school needs a minimum of 20,000 Euro yearly. We collect the financial means by sponsorships (20 € per month), but only additional donations can fill the budget and guarantee the existence of the school. We have to maintain the buildings (giving new roofs for instance, painting doors and windows, we have to replace furniture, buy bed cloths, soap etc.). We need help for modernising toilets, showers and clarification basins. Books and other teaching materials add to the running costs.